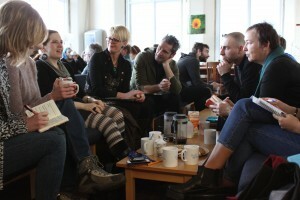 The ASCUS CIIE micro-residency began with coffee in the Darwin Dance Hall, this is the social space within the Ashworth Building where packed lunches are eaten, coffee is consumed and science is discussed. This gave the artists the perfect setting to introduce themselves to one another and share ideas, and the immediate enthusiasm of the artists instantly gave the morning an exciting feel. 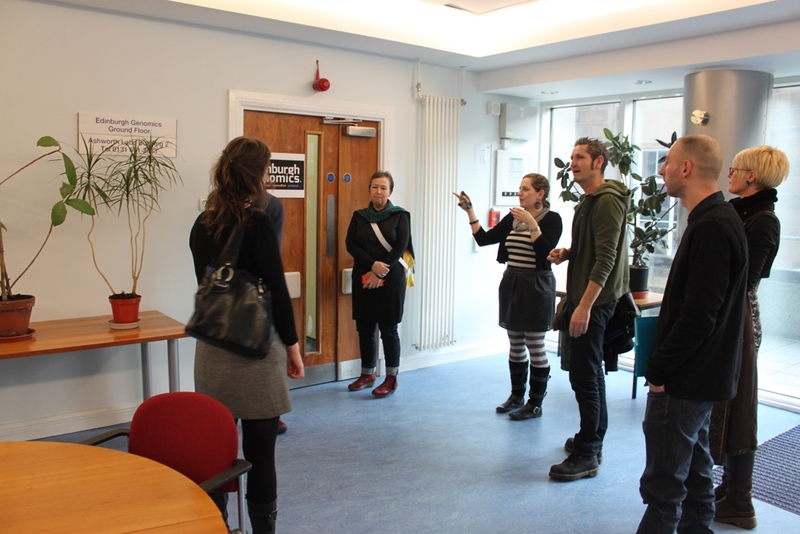 This was swiftly followed with a tour of Ashworth Laboratories, giving our four selected artists the chance to become more familiar with the building and meet the people which they will be working closely with over the coming months. Click here for more information on selected artists. Meeting with the scientists and understanding the work they are doing in the laboratories is a key starting point to the micro-residency. CIIE Fellow Sam Rund researches the Biological rhythms, functions and interactions in insect-transmitted diseases. Sam gave the artists a fascinating introduction and talk about his work with mosquitoes. Sam is currently investigating the physiology and behaviour of the mosquito. As we step into the area where the mosquitoes are kept we were hit by the warmth inside the room, Sam explains how the room needs to maintain this temperature of 26 degrees. He went on to show us the baby mosquitoes up close. It was amazing to see these delicate creatures in so much detail, stimulating a number of questions from the artists on Sam’s research in this area. The second demonstration of the day took place with Phil Wilson, a research assistant working for Little Lab who’s research focuses on evolutionary biology of infectious organisms. As we enter the lab the bubbling green algae attracted all of our attention. Phil gave the artists a thought-provoking demonstration on the work Little Lab does, including the study of immune responses and the genes that cause susceptibility. CIIE Fellow Roman Popat research concentrates on the plasticity in bacteria and the evolution of virulence in opportunistic pathogens. Roman works for the Brown Group studying the social lives of bacteria and the implications of this for disease. 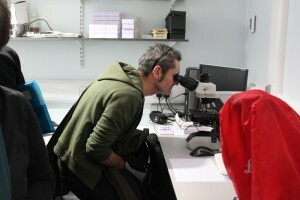 Roman also gave the artists an inspiring insight into his work on bacterial communications. This posed as a potentially intriguing area for the artist to explore more. Next on the agenda Luke McNally talked the artists through his research on Evolution of mechanisms for the regulation of individual and collective behaviour. Luke also works for the Brown Group, and he explained how his research aims to expand the understanding of evolution-proof anti-virulence treatments. Luke presented his complex research in a clear and visual way for us to follow, presenting some fascinating aspects for potential collaboration with the artists. To end the day Kim Prior, a grad student working for Reece lab , talked to us about red blood cells infected with malaria parasites. Kim explained to us how these parasites cause some of the most harmful infectious diseases. Looking through the microscope at cells infected by malaria gave us a sense of how powerful these tiny malaria parasites could potentially be. 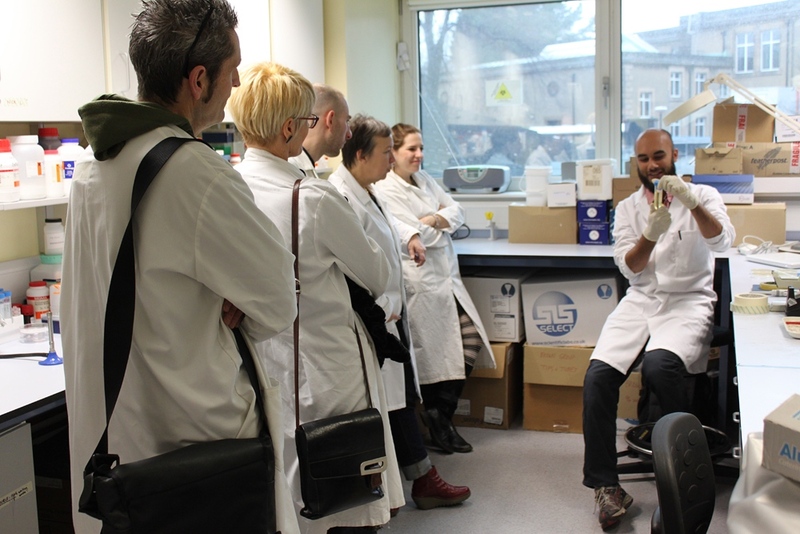 The innovative research that is being displayed by scientists at Ashworth Laboratories will give our selected residency artists a broad scope to work with. On their first day they had a chance to think about initial plans towards the areas in which they found the most inspiring. We are excited to see what will come of these Art and Science collaborations.